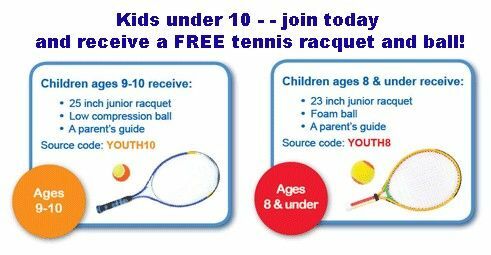 In order to receive the	FREE racquet and ball	with your junior	membership, please remember to	use the source code listed with the specific age group. To take advantage of the offer, consumers can visit www.usta.com/gift or call 800-990-8782. *For members subscribing to an Adult, Family or Life Membership, $10 of all membership dues is allocated for a 1-year subscription to TENNIS magazine. For members subscribing to a Junior Membership, $10 of all membership dues is allocated annually for a 1-year subscription to SMASH magazine. The amount allocated is not deductible from membership dues. All member benefits and offers only available to active USTA members in good standing. Terms of membership and benefits subject to change at the USTA’s sole discretion. Other restrictions may apply. USTA membership is not transferable. 1While supplies last. The actual type and size of all equipment being offered shall be at the sole and absolute discretion of the USTA. Visit usta.com/terms for the complete terms and conditions of this offer. Offer non-transferable. The USTA reserves the right to substitute. Offer expires 12/31/2008. ARV: $21. Please allow 4-6 weeks to receive your junior racquet and ball set. Please contact memberservices@usta.com with questions. © 2008 USTA. All rights reserved.